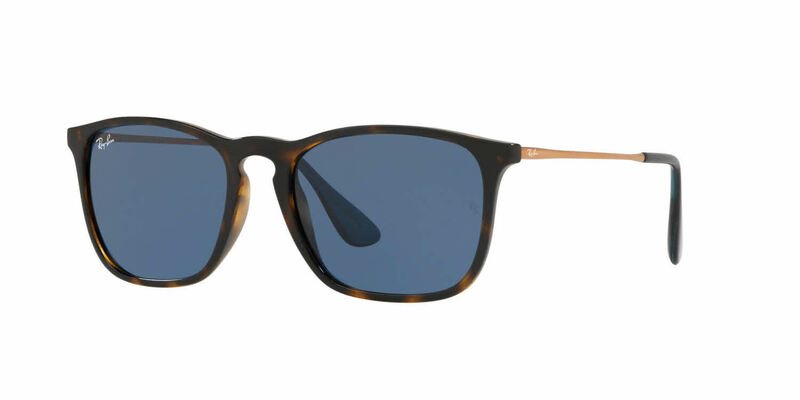 Ray-Ban RB4187 Chris sunglasses are a very unique, modern style due to the non transparent, gummy finish on the frame front. Ray-Ban is a once of a kind brand that is known for its creation of fashion staples and timeless frames such as the Wayfarer. Ray-Ban RB4187 Chris sunglasses feature propionate - a strong, flexible nylon material chosen for its lightweight durability and resistance to warm weather. Available with prescription lenses here. Available with Mirror Coating on polycarbonate lenses which reflect back harmful, UV rays. Available with Gradient Tinted on polycarbonate lenses which fade from darker to lighter colors. These sunglasses are the ideal casual pair to run around in. They are light-weight, and are exactly as pictured-- black from the lens, to the frames, to the arms. They are masculine with their rectangle shape, but work for females as well. Great look! Was not sure of the frame color! But it gives me a different Ray Ban look. Like Wayfair but better. Frame color was liked by all my people. Great glasses!!!! Just as advertised.... Great customer service as well!! This is my second pair of 62mm Ray Ban Aviator Sunglasses- the 1st pair did not have Polarized Lenses, which are great also. I recently bought a pair of RB2025 in Black with polarized lenses and look forward to using the glasses while driving. I like the larger 62mm lenses as I get better coverage when I need the sunglasses the most- when driving. Purchased these sunglasses for my husband for his birthday. They fit him perfectly and are very stylish.